DETROIT - Their birthdays are 12 days apart. Well, that and 18 years. So, when 23-year-old Clay Buchholz is asked whether there was anything about 41-year-old Tim Wakefield - the way he dresses, the music he listens to, the anti-wrinkle cream he keeps in his locker - that reminds him of how old his teammate is, a smile creeps across his face. "If there was something," Buchholz said, "I probably wouldn't tell you about it, because I'm sure I'd hear about it tomorrow." It certainly isn't his pitching (and if Wakefield ever owned anti-wrinkle cream, it probably would be for his glove). And for Tigers manager Jim Leyland, who watched Wakefield hold his team to two hits in eight innings of Boston's 5-0 win last night, there had to be a turn-back-the-clock aspect to the knuckleballer's dominance. Leyland was the manager in Pittsburgh when Wakefield broke into the big leagues in 1992 and was the Pirates' secret weapon as they advanced to the National League playoffs that season. "Just his stories," said 24-year-old Jon Lester, when asked what gets him thinking about the age gap. "There's nothing he does that makes him seem old. He's a normal guy, just like the rest of us." There's something distinctly abnormal about the way the Sox starters - chronologically, from oldest to youngest, Wakefield, Josh Beckett, Daisuke Matsuzaka, Lester, and Buchholz - are trumping opponents this season. Buchholz has a complete-game three-hitter. Beckett has a 13-strikeout game. Lester threw eight innings of one-hit shutout ball. Matsuzaka is undefeated and has thrown seven innings of two-hit shutout ball. In their last 10 games, which represents two turns through the rotation, Sox starters have allowed just 19 earned runs in 88 innings, an earned run average of 1.94. Last night, facing a team that came into this season billed as the league's most formidable offensive machine, Wakefield gave up a two-out single to Carlos Guillen in the first. 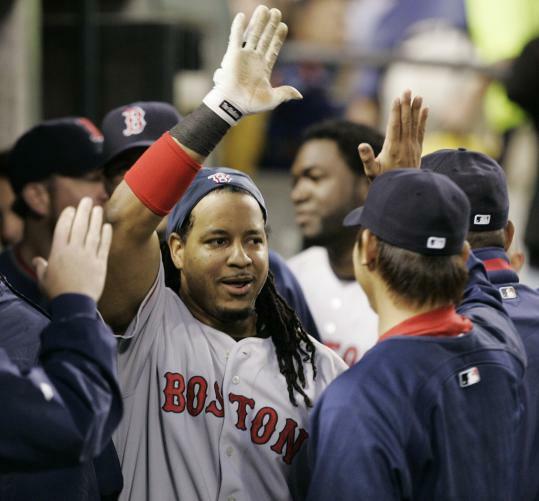 He did not give up another hit until Pudge Rodriguez hit a two-out double in the eighth. He did not walk a batter. He retired 17 in a row from Guillen's hit until Dustin Pedroia's one-out error in the seventh. "And he threw more fastballs and curveballs than he has all season," catcher Kevin Cash said. "Maybe 20-25, more fastballs than curveballs. And look at how many fastballs they swung at, maybe two or three? The rest they took for strikes. "But the biggest thing, of course, was his knuckleball. Everything that came out of his hand was great." Cash's double was part of Boston's three-run rally in the second that staked Wakefield to an early lead. David Ortiz hit his seventh home run, and second in two nights, in the seventh, finishing off Tigers starter Nate Robertson. Leyland summoned Freddy Dolsi, a kid making his major league debut. Manny Ramírez hit his first pitch 427 feet into the shrubs in center field. Welcome to the big leagues, kid. "Four-ninety-seven," Ramirez said as he bolted the clubhouse with a smile, he and Ortiz having homered in the same game for the 47th time. It was Ramírez's first home run in 15 games and drew him within three of the 500 milestone. Ortiz's knee may still be aching, but his slump is clearly history. He has six hits in his last three games, and is batting .423 (11 for 26) in his last six, with 3 home runs and 7 RBIs. Kevin Youkilis had two more doubles and a run scored. Mike Lowell walked to start the second-inning rally, and while he didn't have them shouting "Author, Author" after an 0-for-4 night, he's back and contributing. By Sunday, veterans Sean Casey and Alex Cora should be returning to a team that has won five in a row, seven of eight, and at 22-13 is just two games off the pace it set after 35 games last season, when it reached the quarter mark of the season 10 games ahead of the field in the American League East. They're playing terrific defense, stealing bases, scoring runs, getting great starting pitching, and have a near-perfect Jonathan Papelbon at the end. As balanced as they've been all season? "I'd rather stay away from that," manager Terry Francona said, "because as soon as I say it, we'll be unbalanced. That's why I'd rather keep it to short spurts, like one game. "There are so many ups and downs in a season, and you never know why. You try to know, and sometimes it befuddles you. That's why we just try to win games." The Tigers, meanwhile, have lost five in a row, managed just four hits in two nights against Sox starters, and seem as fragmented as they were at the beginning of the season, when they lost their first seven. And tonight they get Buchholz, who has allowed two runs or fewer in his last three starts. Wakefield could have gone the distance but did not put up a fight when Francona went to him and asked him what he wanted to do. "Your call," Wakefield said he told the manager. Mike Timlin pitched the ninth. He gave up a leadoff single to Curtis Granderson, but erased him with a double-play ball to Placido Polanco. "Got to look out for the 41-year-old and the 42-year-old," Wakefield said. "When's the last time guys that old have combined on a shutout?" Research by the Elias Sports Bureau indicates that last night marked the first time since 1900 a team pitched a shutout using multiple pitchers all over the age of 40. "I wouldn't call it a competition," Lester said when asked if the starters are pushing each other. "But it's one of those things you want to keep going, just like you don't want to make the last out in a rally. "You just want to see every one of us give us a chance to win."